No issue loomed larger in Donald Trump’s winning the Republican nomination in 2016 than his strident opposition to illegal immigration and, more broadly, America’s immigration policies. Trump’s stand on immigration remains the chief inspiration of his political base, who still shout “Build the wall!” at his rallies. But Trump has proven no more successful than his predecessors at putting his policies into practice. Trump’s threats of deportation and his administration’s harsh treatment of border-crossers have failed to halt the surge of illegal immigrants. And the Senate has not even held hearings on Trump’s proposal for immigration reform—embodied in the raise Act proposed by Senators Tom Cotton and David Perdue in February 2017. According to the Skopos Labs, it has only a 3 percent chance of being enacted. But should Congress do anything at all about immigration? Will it recede into the background like the issue of gay marriage, which loomed large in the 2004 election? In a new book, Reihan Salam, the executive editor of National Review and formerly a valued colleague of mine at the New Republic, argues that the continuation of America’s immigration policies poses a threat to its democracy. “Immigration must be reformed because in its current character it is undermining citizen solidarity, producing ethnic balkanization, and breeding polarized backlash,” Salam writes. Salam, the son of Bangladeshi immigrants, makes a forceful case for reform, and his proposals for what to do make a great deal of sense. In the near future, these proposals, like those of Cotton and Perdue, have no chance of getting enacted, but his book may start a needed discussion. But the bill’s sponsors didn’t fully appreciate the long-term effects of its provisions on family reunification that allowed a succession of parents, children, cousins, aunts, and uncles to gain entry. 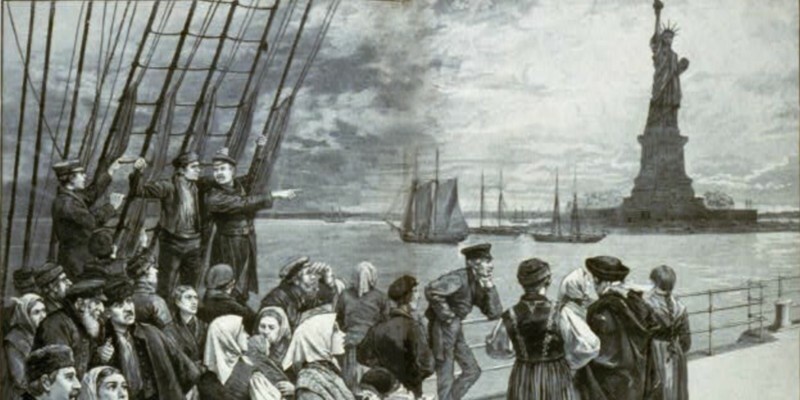 Many of these immigrants lacked education and workplace skills. The bill’s sponsors also didn’t anticipate that the repeal of the Bracero program for agricultural “guest workers,” along with a growing demand for unskilled, low-wage workers in the service sector, would precipitate a rising tide of unauthorized immigrants. About one-third to one-half of the legal immigrants who subsequently entered the United States are unskilled. The percentages are much higher among illegal immigrants—about 70 percent lack proficiency in English. Salam argues that this post-1965 wave of about sixty million immigrants has created an unassimilated underclass whose members, unlike the generations of immigrants that entered in the late nineteenth or early twentieth century, are unlikely to move quickly up the social ladder and assimilate into the American middle class. Their movement upward is impeded in part by their sheer numbers, which allow the new migrants to cluster in ethnically segregated communities, impeding cultural assimilation and the acquisition of language skills. According to Salam, the average male Mexican has arrived in the United States with 9.4 years of schooling. The average of his children and his children’s children only rises to 12.6 years. Poverty rates are 19 percent among the first generation and 15 percent among the second. Their upward mobility may also be slowed by the change in the occupational structure of postindustrial capitalism, which has created a widening gulf between unskilled and college-educated labor and hollowed out the mid-wage, semiskilled middle class—formerly an important rung on the upward ladder for the older immigrant groups. According to Salam, this growing underclass has contributed to a sharp societal division based jointly on color and income, undermining the promise of democracy. The presence within this underclass of 11.5 million illegal immigrants has helped spark a conservative backlash that under Trump has degenerated into an angry nativism directed at Mexico and Mexican Americans. Over the next decade or so, Salam also foresees “a populist revolt driven by the resentments of working-class Americans of color.” I’m not sure about the threat of such a populist revolt, but the contribution of this underclass to a toxic backlash is already apparent and is bad enough to merit concern. In addition, Salam thinks that oversupply of unskilled labor holds down productivity in services, construction, and agriculture. That’s true enough, but he downplays other economic effects of post-1965 immigration. Salam seems to accept the argument, made by liberal economists, that immigration has not brought down wages. In one sense, that’s certainly true. Immigration has had a small effect on median wages, but it has contributed to downscaling in many occupations that once provided mid-wage jobs—including meatpacking, construction, and janitorial services. Employers have replaced unionized native workers with immigrants willing to work at significantly lower wages without the protection of a union. Finally, Salam contends that the influx of immigrants has undermined “citizen solidarity.” It’s a passing judgment on his part, but it’s an important one. The modern democratic welfare state is based on the creation of a virtual community in which citizens are willing to pay taxes to support programs that will benefit other citizens and residents even if they don’t know them. If a group of citizens suspects that some of those whom their taxes support do not share their values (for instance, a commitment to work, if able to do so, or a commitment to defend the country if it is under attack), or if they suspect that the recipients of aid are not even in the country legally, then the trust on which the national community is based breaks down. Groups of citizens come to question the welfare state and even the functioning of democracy. For Salam, the alternative to an ethnically balkanized and highly unequal society is the recreation of the “middle-class melting pot” that existed after World War II—when the 1920s limits on immigration (however discriminatory), the rise of the labor movement, and the collective experience of World War II accelerated the assimilation, and upward mobility, of generations of southern and eastern European immigrants. Salam wants a new, expansive melting pot that includes the generations of Hispanic, Asian, and African migrants that have entered the country since 1965. To do that, however, would require reforming and replacing current immigration laws. Salam, following in the path of Cotton and Perdue, proposes a points-based immigration system that would give priority to education, age, language proficiency, and other skills-based criteria. Family ties would be included as a factor but would not be decisive. Unlike Cotton and Perdue, Salam wouldn’t reduce the number of immigrants; he would only change their composition. In the past, most migrants came in under the provision for family reunification. In Salam’s reform, immigrants would be granted entry based on criteria related to needed skills and employment. To resolve the situation of the most vulnerable members of the current underclass, Salam proposes amnesty for illegal immigrants. They would become legal residents, though not necessarily citizens. To meet the argument that granting amnesty (as Congress did in 1986) will only encourage the flow of new illegal immigrants and the growth of the underclass, Salam proposes instituting a strict E-Verify system that would prevent employers from hiring new unauthorized immigrants, as well as implementing stricter electronic checks on visitors who overstay their visas. To be sure, the move to a skills-based immigration system would reduce the supply of unskilled workers. In response, Salam proposes meeting any resulting labor shortages through further automation and offshoring. He foresees “a more egalitarian society, in which machines do the dirty work and workers enjoy middle-class stability.” Offshoring would have the added advantage, Salam argues, of aiding workers in less developed economies who might otherwise want to migrate to the United States. Unfortunately, Salam’s vision here verges on the utopian. According to the Bureau of Labor Statistics, three of the four occupations with the largest growth in new jobs expected from 2016 to 2026 are personal care aides, home health aides, and food preparation and serving workers—all low-skill, low-paying occupations. None can be outsourced, and the first two cannot easily be automated. But a reduction in the labor supply would create bargaining power for these workers to bid up their wages and perhaps also (particularly in the case of home health aides) to upgrade their skills. While the greatest incentive to assimilation or a new melting pot would probably be a drastic reduction in immigration along the lines of what took place in the 1920s, which undermined ethnic segregation, an emphasis on the immigration of skilled workers could have a similar, if lesser effect. Among Hispanics, who make up the largest single group of legal and illegal immigrants, the tendency to intermarry (and therefore assimilate) rises with class and income. Although Salam’s more limited reforms would not necessarily achieve his vision of a fully assimilated middle-class melting pot, they would move in that direction. And they certainly seem feasible. Canada and Australia have managed quite well using points systems for immigration. A points system that includes age will also not threaten one of the main contributions of current immigration—adding young people to a work force that needs a growing share of taxpaying workers to fund a growing pool of retirees. If anything, a points system will bring down the average age by giving less weight to family reunification, which often brings in aging parents. It will not eliminate inequality, but it will certainly reduce it by diminishing the huge underclass that the immigration of unskilled workers has contributed to. In the past, the requirement for employer verification has not discouraged illegal immigration. The original provision—included in the 1986 bill on the insistence of the afl-cio and naacp and over the opposition of the U.S. Chamber of Commerce—created economic penalties if employers “knowingly” hired illegal immigrants. But the absence of a systematic means of verifying such knowledge allowed employer and employee to evade enforcement; and the absence of labor protections for illegal immigrants gave employers, seeking to cut costs, an incentive to hire them. During the George W. Bush administration, the U.S. government also put a very low priority on enforcement. In 2003, only four employers were fined for hiring illegal immigrants. The use of a national computer database would force employers to verify employment and make it difficult for illegal immigrants to evade detection. If properly enforced, it would make the unworkable provision of the 1986 bill workable. The institution of an E-Verify system would discourage illegal immigration more effectively than increased border patrols and a wall. Illegal immigration would continue, but at a much lower and less politically combustible rate. Could Salam’s reforms be enacted? With the current Congress and White House, almost certainly not. In 2013, fourteen Republicans joined the Democrats to pass a comprehensive reform bill. These Republicans generally follow the lead of business, which wants to retain a large and growing immigrant workforce to keep costs down. (Usually, these Republicans call for an accompanying increase in guest worker programs that force down wages.) Taking cues from former Bush adviser Karl Rove, these Republicans also believe that over the long run Republicans have to neutralize the Democratic appeal to Hispanics. But the 2013 bill died in the Republican House and, of the four Senate Republican cosponsors, John McCain has passed away and Jeff Flake is retiring. What little support for reform existed in the House was obliterated when Tea Party favorite David Brat defeated Majority Leader Eric Cantor in the 2014 Republican primary by charging that Cantor was a proponent of amnesty. The House Republican antipathy to any reform involving amnesty is driven by the Republican base in the white working and middle class. To explain this base’s opposition, Salam cites two political scientists who argue that “much of the opposition” to illegal immigrants is driven by a “commitment to the rule of law.” This conclusion, however, strikes me as the usual product of abstract political science analyses. Support for the rule of law is surely one factor in the Republican base’s antipathy to illegal immigration, but it’s not the only one, and often, in my experience interviewing Trump supporters and others on the front lines, it’s not the principal factor. Americans who are up in arms over illegal immigration believe immigrants are taking jobs from native workers, driving up public costs, and committing crimes. They don’t like hearing Spanish instead of English. They fret, in the words of conservative columnist Laura Ingraham, that “the America we know and love doesn’t exist anymore.” And their dislike of illegal immigration is fed by a fear of Islamist terrorists, whom they believe are able to enter America’s porous borders. Politically, they (and their politicians) fear that growing numbers of immigrants will eventually create permanent majorities for Democrats. Democrats are also divided about immigration reform. There is considerable support for creating a path to citizenship for illegal immigrants, but little enthusiasm about strengthening enforcement or changing admission priorities. Democratic politicians and consultants object to numerical restrictions on immigration that might reduce the chance for a majority-minority nation, which they believe, on the basis of spurious census figures, would vote Democratic. There is also an influential group of Democrats, clustered in the media and among activist groups, which favors open borders. Their views partly reflect a cosmopolitanism that denies national identities as well as what Salam calls the “backlash paradox.” They are responding to blatantly nativist appeals on the right by doubling down on their support for all legal and illegal immigration. In today’s Washington, however, the main obstacle to immigration reform lies not among the Democratic proponents of open borders (they remain marginal to the party) but the Republican foes of amnesty and the Republican base they represent. Were their opposition to diminish—not necessarily in size, but in intensity—mainstream Democrats and Republicans could probably reach a compromise that bore some resemblance to Salam’s proposals. Though it is unlikely that this compromise will happen during Trump’s presidency, it could happen under a different president and Congress—but only if a change in administration were also accompanied by a dramatically reduced threat of Islamist terrorism. The fear of terrorists entering the country has given opposition to immigration its ideological edge and its political salience. It was an important factor—brought home by attacks in San Bernardino and Orlando as well as in Paris and Nice—in Trump’s election in November 2016. In the absence of a change in Washington and a reduction in the threat of Islamist terror, political discussion is likely to continue pivoting around defending or opposing Trump’s provocative rhetoric and border wall proposals. Salam’s answer to this challenge is to foster economic development in poorer countries. “It’s time for Americans to roll up their sleeves and help,” Salam writes. Some of Salam’s proposals would not involve foreign aid. He wants the United States to encourage rather than discourage the outsourcing of low-wage, low-skill manufacturing on the grounds that it will help citizens in poorer countries and reduce their incentive to migrate to the United States. That’s a fine goal, except for the fact that outsourcing increasingly affects high-skilled jobs. Most low-cost clothing and toys sold in the United States are already made elsewhere. Salam’s other proposals, such as support for “charter cities” abroad that would become magnets for foreign investment, might well involve foreign aid. Insofar as these proposals can be justified on the grounds of national interest, they can be debated in Washington and in middle America. For instance, it would be in the national interest to foster economic development and stable democracies in Latin American countries whose citizens are currently fleeing to the United States. But insofar as Salam’s proposals, like those from writers at more liberal publications, appeal to a universal obligation to aid those in need, they are likely to fall flat. For better or worse, most Americans—as well as the citizens of most other nations—think of what is good for their country. Except in rare instances, they don’t weigh policies on the basis of what is good for foreign countries and workers. The strength of Salam’s argument and of his book lies squarely in its appeal to national interest rather than in any appeal to ethical universalism. 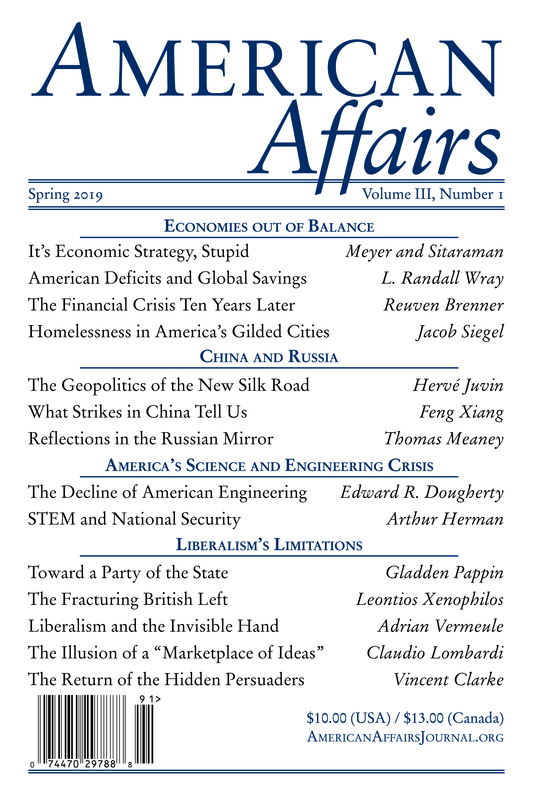 This article originally appeared in American Affairs Volume II, Number 4 (Winter 2018): 31–39. 1 National Academies of Sciences, Engineering, and Medicine, “Immigration’s Long-Term Impacts on Overall Wages and Employment of Native-Born U.S. Workers Very Small, Although Low-Skilled Workers May Be Affected, New Report Finds; Impacts on Economic Growth Positive, While Effects on Government Budgets Mixed,” news release, Sept. 21, 2016. 2 United States Commission on Civil Rights, “The Impact of Illegal Immigration on the Wages and Employment Opportunities of Black Workers: A Briefing before the United States Commission on Civil Rights Held in Washington, D.C.,” Oct. 14, 2010. John B. Judis is the author, most recently, of The National Revival: Trade, Immigration, and the Revolt against Globalization (Columbia Global Reports, 2018).